Happy Sunday, friends! I hope you are having a blessed day with your loved ones! It's the 21st which means it's time for another story to share for the Downright Blessed: Life with Down Syndrome series! This series has been ongoing for 6 months now. It's definitely one of my favorite monthly features! I'm so excited to introduce you to a beautiful little girl named Zoey Grace and her awesome mama, Sasha! I first connected with Sasha through Instagram, and we eventually became friends on Facebook. As a new(er) parent on the Down syndrome journey, I loved to see pictures of Zoey living life to the fullest. Zoey filled my heart with so much hope for Liam, and Sasha has always been so supportive! Sasha is part of the DS "tribe" that I love so much and there is absolutely NO doubt that Zoey is happy and thriving. Zoey certainly brightens my days, and I'm sure she will brighten yours, too! Downright Blessed is the perfect title for these posts, as that's exactly how I feel about life with my daughter! Hi, I'm Sasha and I'm so excited to share our story. Early in the year 2009 we had decided we would add to our family. At the time we had three children: Annicka (8), Jericho (4), and Liam (1). Our plan was to wait for 2010, but I had prayed that God would send us a child in His timing and in May 2009 I discovered I was expecting our fourth child! On September 9th I went for my 19 week ultra sound. All I could think about was finding out if I'd have a third boy OR the second little girl I had been waiting for! The news that our baby was a girl was so exciting, but quickly clouded by the information that she had fluid in her brain ventricles. On October 12th I had a follow up u/s and they saw that the fluid in the ventricles had gone down, but the tech was pretty sure he saw two small holes in her heart ... an amniocentesis was recommended. I still shudder to remember the mention of termination - clearly I had never experienced that in previous pregnancies and I was actually shocked it would be brought up. I knew that no matter what, termination was not an option. I went home to give good thought to whether I would have the amnio. In the meantime I traveled to Los Angeles for a high tech u/s with a specialist at CHLA. At my next appointment I went ahead with the amnio and then the waiting began. It was an agonizing time. I prayed and prayed and begged God to "please let her be healthy and not have Down syndrome." I remember thinking that Down syndrome wouldn't be such a big deal, compared to the many things that could actually be "wrong," nonetheless I was scared of the unknown. I had a good friend who worked with children and adults with special needs and remember I felt like "I can't be a special needs parent, I've never been drawn to people with special needs" (essentially meaning I had no experience). On October 22nd the doctor called, "I'm sorry, your baby does have Down syndrome." I held it together to quickly finish up the call. Then I broke down in tears. Gathered myself again and called my mom. She was at work but I knew she was waiting to hear ... it just so happened that my best friend was there too. I remember crying on the phone and my mom saying "it's going to be okay." My mom and friend (who is more like a sister) said a prayer over the phone. I had them pray for me to be strong when telling my husband. I was so nervous about how to have that conversation. All I remember from telling him, is that he said something like "we'll deal with what comes as it comes" ... in other words, he was saying don't worry about everything that could be. I think that was the moment that truly changed things. Sure, all the unknowns were still scary, but worrying about the "what ifs" wasn't going to make a difference. January 23, 2010 was the day our sweet baby arrived. Ten days before her due date and it was my first time going into labor (I was induced with the first three)! She weighed 8lbs 8oz and was 21" long. I'll never forget them handing her to me - finally, I got to see that face I had so longed to lay eyes on. She looked right at me and I knew immediately that my life had just changed forever and for the better! We named her Zoey Grace Mabel! Zoey was a name we had always liked. At some point, after hearing she had medical issues, I had looked up the name Zoey and found that it means "life." It was perfect! She was then whisked away from us and sent to the NICU. Thus began five and a half weeks in the hospital, between two different NICUs. She was just so sick, due to her congenital heart defect (a complete AV canal). The hospital where she was born had done everything they knew how, so she took a helicopter ride down to UCLA Mattel Children's Hospital. I went and stayed nearby, as I was supplying her nutrition! I won't say it was easy. Being away from my other kids was especially hard, but we made it work and got through it and finally brought her home! On April 20th, just shy of three months old, Zoey had open heart surgery to correct her CHD. I tell you what, that was another life changing day! Suddenly my weak and seemingly fragile baby had some sass!! We started seeing her little personality come out and it was extraordinary! Zoey Grace is now six years old and she is truly the light of our family's life! She loves to sing and dance, she loves to color and play with play dough, she loves to reenact movies and music videos - she is SO fun! She's a daddy's girl, but also has plenty of love for mama and her siblings, whom she she also loves to tease! I am currently homeschooling Zoey. She's learning to read, she can write her name, and we're working on counting, as well as other things! Our lives are changed, but I like to share and show people that it really is for the better. I would not be the person I am today without my little girl. She always makes me strive to be my best version of myself! It's something that is hard to explain, so I encourage people to make a point of spending time with individuals with special needs. I believe you will quickly see why I say it's a beautiful life...it's a bella zoey! Thank you so much for sharing your story, Sasha! Zoey brings a smile to my face every single day! You can find the adorable Zoey Grace on Instagram and Facebook. 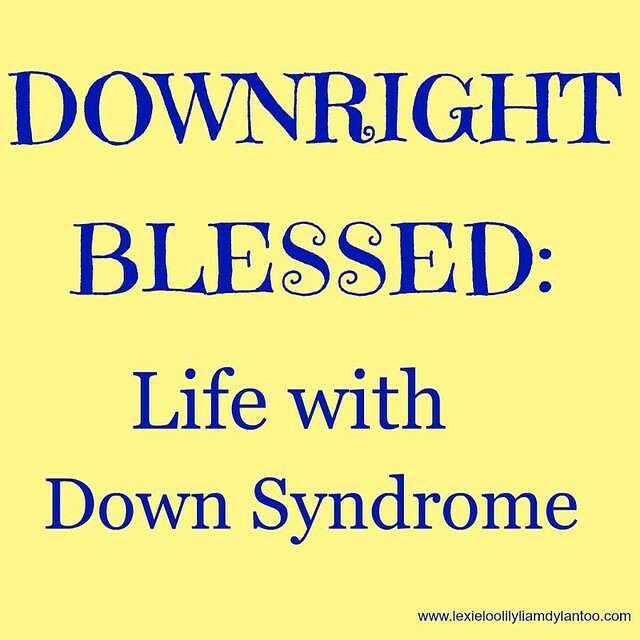 If you would like to contribute your story to the Downright Blessed: Life with Down Syndrome blog series, please send an email to lexieloolilyboodylantoo@yahoo.com. She's a beautiful little girl! Thanks for sharing this story! She sure is! Thank you!